Errol Povah was arrested on 19 July 1996 for tossing a paint bomb at a "Player's Racing" billboard. He was tried for this offense on 9 January 1997. The result was a conviction, but an absolute discharge. This means no fine, and no criminal record. The transcript of the trial which follows is an important document for several reasons. It includes an admission by an employee of Seaboard Advertising that "Player's Racing" billboards are, in reality, cigaret advertisements. It also includes testimony by Prof. Richard Pollay and Dr. Fred Bass on how tobacco advertising targets teenagers, and an eloquent statement by Errol Povah on the public menace of tobacco promotion. MS. CARTER: Good afternoon, Your Honour, Jan Carter for the Provincial Crown. Calling number 7 on the list, the matter of Errol Povah. THE COURT: I understand -- the prosecutor indicated to me earlier that you no longer are being represented by a lawyer; is that correct? THE COURT: And you'll be acting for yourself this afternoon, will you? THE ACCUSED: Yes, Your Honour. THE COURT: All right. Errol Eric Povah, you're charged on or about the 19th day of July, 1996, at or near the City of Vancouver, Province of British Columbia, did commit mischief by wilfully damaging a billboard, the property of Seaboard Advertising Company the value of which does not exceed $5,000, contrary to section 430(4) of the Criminal Code. Do you understand this charge, sir? THE ACCUSED: Yes, I do, Your Honour. THE COURT: And how do you plead, guilty or not guilty? THE ACCUSED: Not guilty, Your Honour. MS. CARTER: Crown calls Jim Bailey. Q Mr. Bailey, do you work for Seaboard Advertising Company? Q Is Seaboard Advertising Company the lawful owner of property located in the 600 block West 6th Avenue in the City of Vancouver, Province of B.C.? Q What in particular do you own there? A We own the actual billboard structure. Q Are you aware of any damage to that billboard occurring on July 19th 1996? Q Can you describe first of all the billboard? A The damage was caused to the advertising on the billboard face. It was reported to me on the following day, and it was paint thrown on the billboard. Q Okay. I actually wondered what the billboard said. A Oh, the billboard was a advertising for Players Pacific. THE COURT: Advertising for what? A For Players. It was a cigarette advertisement. THE COURT: A cigarette ad? MS. CARTER: Q Can you advise the Court what it cost to repair that damage? A Yes. The replacing the poster, the poster itself is worth $800. The posting fee is another $60, so it would be a total of $860. MS. CARTER: Thank you. Those are my questions. If you could just answer any questions Mr. Povah may have. THE COURT: Do you have any questions of this witness, sir? THE ACCUSED: I do, Your Honour. THE COURT: All right. If you'd stand, please, while you ask questions. Q Mr. Bailey, sorry, I won't -- what is your position with Seaboard? A I am the plant superintendent. Q Okay. You indicated in your previous testimony that it was a cigarette ad that was on the billboard. A Well, it was a Players, Players advertising. Q But you would -- you would characterize it as a cigarette ad? A It was a cigarette company, yes. Q Okay. I'm also curious about the discrepancy in my -- the paperwork particulars. There was a copy of a letter from Seaboard Advertising indicating that the cost of repairs for the sign was $250. You're now saying it's 860? A I am saying that to replace the advertising is $800. The cost of posting is $60. Q I -- I'm still not clear about the discrepancy. Why in the original letter did it indicate 250? A I don't know who you received the original letter from. THE COURT: Okay. Just a second, sir. Was it repaired or was it replaced? A The poster was replaced. THE ACCUSED: Q Could it not have been repaired? A It would not have been able -- would not have been repaired, no. It couldn't have been repaired. THE COURT: Are you calling anybody else from Seaboard? MS. CARTER: No, Your Honour. THE COURT: You're not. What do you know about the discrepancy, anything? THE COURT: Or this letter that says $250? MS. CARTER: There is a letter from a Mr. John Sawyer in the particulars. Perhaps that letter could be put to the witness. THE COURT: -- from Seaboard? Show that to this gentleman. Let him read it and see what he has to say about it. THE COURT: Miss Carter, do you have a copy? MS. CARTER: I have a copy. THE ACCUSED: Not 100 percent -- oh, I'm sorry. I have it here. THE COURT: That's all right. The prosecutor should have one. THE ACCUSED: I have it here, Your Honour, this letter from a John Sawyer. THE COURT: Do you want to just read that, sir, and then comment on it? A That is definitely a letter from our -- our operations manager. THE COURT: All right. Do you want to just tear that out of your particulars and we'll file it, sir? THE ACCUSED: Okay, Your Honour. THE COURT: And do you have any comment, sir, about why he says 250 and you say 860? A Yes, I can make one comment. When -- when we order a group of posters for an advertising campaign we may have 50 posters made up, we may have 150 posters or we may have 25 posters. When we -- when we have to replace and have one poster made up it makes a great difference as far as the cost of the -- of the poster. In other words, if we make up a group we get a much smaller price than we do if we make up a -- only one poster, and that would be the reason for the price discrepancy. THE COURT: So you're saying in fact this poster cost $800? A To make this poster up, yes, specifically to replace that poster, that would be $800. THE COURT: Okay. That's his evidence. You can argue about it later, but that's what he's telling us. THE ACCUSED: Okay. I'm sorry. I was somewhat distracted there for a moment. If I may, Your Honour. Q Did you indicate while I was distracted that if there's a large number of the posters ordered the price goes down, that if there was just one it's somewhat higher? A Yes, it's -- it's the same as if you are manufacturing anything. It costs a great deal of money to make one, whereas if you make up a large group it's considerably cheaper. Q Right. I understand that. Having said that, it also states in that letter from Seaboard Advertising that many of them were done, there was much of that similar damage. Q So does that not lead one to believe that -- that you would have -- you would have ordered many of them as opposed to just one? A We would have replaced definitely more than one or two. We had probably in that -- in that particular campaign, we may have had up to somewhere between 30 and 40 billboards that had been damaged to different degrees. Some of them we could repair, some of them we would replace. THE COURT: All Players, sir? THE COURT: All right. Do you have anything in writing to confirm in fact it was $800? THE COURT: Are you telling me for each of the billboards that were replaced it was $800 for each one, or can you say that? A No, I cannot honestly say that it was $800 for each one. THE COURT: Okay, all right. Okay. THE ACCUSED: Okay. Thank you, Your Honour. A Well, the advertising was for an event and the ad -- the event, of course, was sponsored by a tobacco company. Q Which event is that? A That -- that, I believe, was Players Pacific. THE COURT: The event was what? I'm sorry, I didn't hear what you said. A I believe that was Players, Players Pacific. THE COURT: Players Pacific is an event? THE COURT: The race, okay. THE ACCUSED: Q It's all part of the Molson Indy, though, is it not? A Yes, that would be part of the Indy. Q Right. Okay. Are you aware that tobacco advertising is aimed at youth, children? A I have no -- I have no particular -- I have no control over the advertising that my company accepts. Whether the advertising is designed for youth or not, I suppose, is a matter of opinion. Q Okay. So you don't have any qualms whatsoever about accepting money from a tobacco company to help them in their efforts to promote an addictive, deadly drug? A I receive money from the company that pays my salary. How that company gets it is their concern. I have nothing to do with the advertising that is accepted. THE COURT: Excuse me just a moment. You're not calling anybody else from Seaboard? THE COURT: Are you calling any other witnesses at all? MS. CARTER: Yes, I am. I'm calling the witness who witnessed the mischief. THE COURT: I see, okay. THE ACCUSED: Okay. That's all I have for this witness. MS. CARTER: Crown calls Dean Eng. Q Mr. Eng, on July 19th 1996 were you in the 600 block of West 6th Avenue in Vancouver, B.C.? Q And did you observe an incident that brings you to court today? Q Approximately what time was that? A That was at approximately 7:45 p.m., Your Honour. Q Where exactly were you located? A I was driving my car on the 600 block West 6th Avenue, Vancouver, westbound. Q And can you describe for Her Honour what you saw as you were driving through the 600 block? A I was driving in the curb lane and I observed two males that were both facing the -- off the road, throwing some objects at a billboard sign. As I drove past them I -- I observed them throwing more objects at the sign, and when they hit the sign the objects dripped paint out of them. Q Can you describe that sign? A It was a Players advertisement. It depicted a scene of an Indy racing car and the Players logo was on the side. Q When you say the objects dripped paint out of them, did the paint go on the sign? A Yes. The -- the paint was on the sign. There were several different colours of paint on the sign. Q And how big were the areas of paint? A They were big enough for me to observe at about 100 feet away. Q Were they in one place or all over the sign? A They were all over the sign. Q You say that you saw two people? Q What did you do after you saw them do that? A I turned my car around in the intersection immediately west of the sign and observed them, the two males that had just finished throwing those objects at the sign, walking south on the 2200 block of Heather Street up towards 7th Avenue. I -- I then -- at 7th and Heather I identified myself as a police officer to the two males. Q Are you indeed a police officer? Q Were you on duty at that time? Q And what police force are you with? A I'm a regular member of the Royal Canadian Mounted Police. Q What did you do at that point? A I then told the two males to stop. They both did. I informed them that they were under arrest for theft, or mischief under $5,000. One of the males continued walking away from me up Heather Street, south on Heather. The other male stayed with me. Q Did you pursue the one who left? Q Can you describe the one who stayed with you? A The gentleman seated before Your Honour in the -- in the suit is the male that stayed with me. MS. CARTER: Noting the indication. Q Did you see the gentleman you have just identified throw an object at the billboard? Q What happened at that point? A At that point I asked the male to accompany me to the Vancouver Police Department located on 2120 Cambie Street, and we both walked there together to the front lobby. I approached one of the Vancouver Police officers in the lobby and explained to him that the accused wanted to turn himself in for throwing paint at a sign. Q And did you have any further involvement in the investigation? Q Thank you. Those are my questions, Your Honour. THE COURT: Sir, do you have any questions of this witness? THE COURT: Yes, all right. Stand, please. Q Constable Eng, first just a minor detail. You indicated you were driving westbound on West 6th at about 7:45? Q Was it not 6:45? A I -- I don't believe it was. Q Okay. Okay. You indicated that you identified yourself to the defendant and another male as a police officer. How -- how exactly did you do that; do you recall? A I produced my badge and ID card and displayed it to the two males. Q Did you verbally say that you were a police officer or did you in fact just show, display the badge? A I displayed my badge to them, Your Honour. Q Is there any particular reason why you wouldn't say, "I'm a police officer," because I'm sure you're as aware as most of us are that security guards have badges. There's -- I don't think there's any shortage of fake badges out there. A Well, because of what one of the two males said to me, it was clear to me that I was identified by one of the two males as a police officer. Q You're referring, I presume, to the comment about my -- my sister died, my aunt's sister, something along those lines, of -- of lung cancer? A No. No, I'm not referring to that, Your Honour. A No, I'm not referring to that, Your Honour. Q Oh. What was said that -- that would lead you to believe that the individual thought that you were a -- or assumed you were a police officer? A The individual who said that is the one that escaped, and he told me, "So what if you're a cop?" Q Okay. You say you saw the defendant throw something at this billboard. Could you go into a little more detail about that, like exactly what you saw? For example, was the defendant and the other individual just carrying these things in their hands? Were they in a bag? Were they -- how big were they? A I -- I directly observed both the males throwing objects which were about roughly the size of a golf ball to a tennis ball, at the sign. Q Did you -- did you observe anything that they might have been carrying those in, a plastic bag, a paper bag? THE ACCUSED: Okay. Okay, that's all I have, Your Honour. Thank you. MS. CARTER: That's the case for the Crown, Your Honour. THE COURT: All right, sir. You have a choice at this point as to whether or not you wish to call evidence or give evidence yourself. That's entirely up to you. THE COURT: If you'd just stand, please, sir, when you're speaking. THE ACCUSED: Oh, I'm sorry, Your Honour. THE ACCUSED: It's my understanding that if I were to call the witnesses I had hoped to call at all that would happen at sentencing as opposed to during the trial, so having said that, I have no witnesses to call. THE COURT: All right. Do you wish to give evidence yourself? THE ACCUSED: This is somewhat of an awkward position. I -- I find myself trying to play the two roles of defendant and defence counsel. THE COURT: -- we get that far, so right now I'm just dealing with the issue of guilt or not. THE ACCUSED: Okay. With that information I will not be calling any witnesses and I will not -- I have no evidence. THE COURT: All right. Okay. Thank you, sir. THE COURT: All right. The accused is charged with mischief. He's representing himself, and he did quite a good job cross examining the person from Canada -- or from Seaboard Advertising. 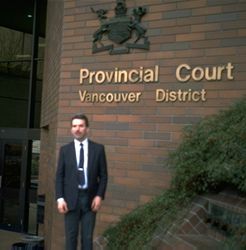 In terms of what the Crown has to prove, they have to prove that this individual in front of me on the 19th of July 1996 at the City of Vancouver, Province of British Columbia, damaged the billboard, and in terms of the evidence that I've heard I'm satisfied beyond a reasonable doubt that they have proved all of those elements. As the Crown concedes, they haven't proved this $800 figure, but I'm satisfied there is damage to the billboard which has some value. Accordingly I find -- find Mr. Povah -- is that the right way? THE COURT: I find you guilty of the offence, sir. All right. Is there any criminal record? MS. CARTER: There's no record to allege, and Crown's not opposed to a discharge, Your Honour. THE COURT: All right, sir. What the Crown is telling me is one, they don't have a record, they're not alleging a record for you, and two, they're not opposing a discharge, and I don't know how much discussion you had with anyone in the legal business about a discharge. The consequences of a discharge are that it can be either conditional, that is you enter into a probation order and do certain conditions, or it can be absolute, but the net result is at the end of the discharge period there is no criminal record arising out of the -- arising out of the offence, so just so you know, that's where they're coming from in terms of what they're asking me to impose. All right. Now, you indicated you had some people you wished to call on sentencing or a statement you wished to make yourself? THE ACCUSED: Yes. I'm somewhat concerned about taking up too much of the Court's time with this. However, if I could call one witness. THE COURT: What's his name? THE ACCUSED: Professor Rick Pollay. THE COURT: Perhaps just before you start... When this gentleman called you he said professor. Perhaps you could just tell me what your academic background is so I have some idea what I'm dealing with. A Yes. My background is in marketing, consumer behaviour and advertising. I teach in the Faculty of Commerce at the University of British Columbia and have done so for the past 26 years. THE COURT: And what's your academic background, sir? A I have a Ph.D. in Consumer Behaviour from the University of Chicago, a Master's in Business Administration also from the University of Chicago. THE ACCUSED: Thank you, Your Honour. Q Professor Pollay, thank you for coming today. A couple of quick questions here. Do all -- do all billboard companies run cigarette ads? A No. In fact, there are some billboard companies as a matter of policy that refuse them because they find it morally compromising to -- to do that, to run billboard ads for tobacco companies. Q Okay. And are you aware of any -- obviously they've made a -- somewhat of a moral decision. Are you aware of the financial consequences of that to them? Are they suffering financially as a result? A It's a little hard to assess with total precision. There certainly would appear that they're foregoing that tobacco income, but of course they end up renting the billboards to other manufacturers, other advertisers, and probably at the same rates. That is, it's not clear that they have to drop their prices in order to continue to rent the amount of space they have for sale. A So I would say generally speaking they suffer little if any expense for this decision. Q so it's your opinion that Seaboard or -- or any other billboard company across the country could easily make that same decision and at no -- little or no financial loss? A I -- I think so. I mean, it would require some sales effort to find other people who aren't as eager to have the billboard space. The tobacco companies are particularly eager for the visibility that billboards provide. Q Right. Okay. I've lost some of my notes here, but are you familiar with this document? A Yes, I am. It's a document I authored that reports the -- the nature of the tobacco strategies of the Canadian tobacco firms that were in the Tobacco Products Control Act, R.J. Reynolds, Macdonald and Imperial Tobacco. It's a report that I wrote for the Association of Consumer Research and published in their proceedings. A Well, the -- the evidence here that's reported here and the piles of documents like it that I reviewed in the course of serving as expert witness in that trial, show without any doubt whatsoever that the industry has an intense strategic interest in children that they pursue. Their research is on the behaviour of 11, 12 and 13-year-olds. They target 15-year-olds. They target 15-year-olds that are non-smokers. Q And in your opinion why do they target children of any age, for that matter. A Because cigarette smoking behaviour begins in adolescence. The modal years of starting tend to be 12, 13, 14 years old. Because of the addictive nature of nicotine there's a phenomenally high level of brand loyalty in this business, so once you start with a particular brand such as Players, you stay with that brand, so that the only way to compete effectively against others and to win business new is by doing so among the adolescents. Adults do not switch brands, or at least they switch at a very, very low rate compared to any other product we know. Q Right. Has there been a trend, have you noticed a trend over the years regarding that minimum or -- or that general average age for the onset of smoking? A The onset of smoking has been going down. That is, smoking begins at younger and younger ages, and that's attributed to the kind of media effects. That is, younger and younger children are more and more aware of the world in general, so we see similar phenomena among sexual behaviour, for example. THE COURT: Could I see that report that you referred to, please? Could you just pass it up to me? Thank you. All right, sir. Would you have any objection if we marked this as an exhibit on sentencing? You don't need it, or you can get other copies of this -- this article? THE ACCUSED: Yes, I can, Your Honour. I don't object. THE COURT: -- if someone's taken the effort to come down and you think it's worth calling them and they're as impressive as the last witness, then you go ahead and call them. THE COURT: Dr. Bass, yes. THE COURT: When you were called in the witness referred to you as Doctor. THE COURT: You're a medical doctor, I gather? THE COURT: -- what your situation is at this point. A Okay. I am a -- I am a physician, also a doctor of science. I direct -- my work here is to direct the B.C. Doctors Stop Smoking Program, which I have done since 1960. I am also chair of the Tobacco and Illness Committee of the B.C. Medical Association. My specialty in medicine is preventive medicine and addiction medicine, Your Honour. Q Dr. Bass, how serious is tobacco use? A It is the most serious cause of preventable disease in the world, in Canada and in Vancouver. A In the next decade, tobacco, smoking tobacco will kill more people than will AIDS, motor vehicle accidents and hard drugs put together. That -- that's the way it is in the United States; that's the way it is in the world. Tobacco has killed more people than -- in the nineties tobacco will have killed more people than all the wars fought in this century. It is the most preventable cause of death. Q So it's fair to characterize it as an epidemic? A It is an epidemic. It's been called the Brown Plague, and it has already killed more people than the Black Plague ever did. Q Okay. Do you -- do you find it at all interesting or odd that when we talk about AIDS we -- we often hear it in terms of the AIDS epidemic, and yet when people generally talk about tobacco it's just tobacco, no problem? A It's odd. It's very unfortunate. A In one case we have a virus; in the other case we have a -- a manufactured, marketed product that's positioned as a consumer product but really deserves to be a very controlled, hazardous substance, and what's peculiar is that it's been a third of a century since the best minds in public health and medicine have said that this product was killing the customer. Q What do you think is the role of advertising and -- and marketing? A Well, advertising and marketing is one of the major means of the persistence and legitimization of this product, so that it again is positioned as a consumer product when in fact it is a very hazardous product that deserves as much control as any product. Q Right. And -- and who do you think are the primary targets of the industry that produces this product? A Well, the only people who start to smoke are youngsters between the age of nine and up to the age of -- 90 percent of smokers start by the age of 18, so that positioning it as an adult activity to youngsters is basically -- an adult or alluring activity is basically a major recruitment mechanism in terms of the imagery of the product. Q -- to deal with this problem? A -- eliminated, in federal law a -- a law -- it eliminated advertising and promotion of tobacco. There was a loophole that allowed product names to be used, and through that loophole came Players racing, the Benson & Hedges Symphony of Fire and other vehicles for spreading the name of a particular brand. Now, in September of '95 the Supreme Court found that the federal government had not proved its case, that it recognized that it had the capacity to control this, quotes the Supreme Court, "this evil," and they have in law the Hazardous Products Act, which I don't understand why they haven't implemented, but anyway, there are -- I think what is relevant here is that Canada actually forbade the advertising and promotion of tobacco and is about to do that again and could do that tomorrow if it adopted the Hazardous Products Act. THE ACCUSED: Right. Okay. Thank you very much, Dr. Bass. THE COURT: Do you have any questions? THE COURT: Thank you very much, sir. You're free to have a seat or to leave. THE ACCUSED: If -- if I may, Your Honour. I appreciate your patience and indulgence. THE COURT: If you'd stand, please. THE ACCUSED: Certainly. I have the utmost respect for the police. One of my best friends is a police officer. I also respect the Court, and for the most part I respect the law too, as can be confirmed by the fact that to date I have no criminal record. But when it comes to tobacco, recent history clearly shows that what is or isn't law regarding tobacco advertising sponsorships, et cetera, depends almost exclusively on the extent to which the overwhelmingly wealthy, politically powerful and corrupt tobacco industry wants to flex its muscles. One doesn't have to be a rocket scientist to realize that the primary objective of the tobacco industry is to target and seduce and hook and ultimately kill children, the new recruits or replacement market for the tobacco industry necessary to replace the 45,000 Canadians that their products kill every year. When did murder become legal? It seems that if you kill somebody -- someone instantly with a gun or a knife you go to jail for a while, but if you do it over a period of several years, carefully manipulating the various carcinogens and toxic poisons in -- in your product, not only do you not go to jail, but through events like the Players Indy, Du Maurier Jazz Festival, Benson & Hedges Fireworks, Du Maurier Golf, Export A Skins Game, Du Maurier Concert Series to name just a few of the tobacco-sponsored events we're inundated with every summer, you actually look like a good corporate citizen. As a doctor from the World Health Organization once said, there can never be a peaceful coexistence between the tobacco industry and the world health community. The tobacco industry should be on trial here. The industry never has and never will prove that its products are safe. That is a very basic requirement of virtually every other consumer product on the market, yet society seems to turn a blind eye to tobacco. What I did was nothing worse than breaking into a burning house to rescue someone from a fire, or to put it another way, I'm somewhat like a flea on a dog, although to make an analogy between dogs and the tobacco industry truly is an insult to dogs. Having said that, right now I feel somewhat like I am the only flea, but I'm hoping many others will join me and drive this dog, the tobacco industry, crazy. Thank you, Your Honour. THE COURT: Let me ask you this, sir. I'm just curious, having heard all of this evidence. Did you or any members -- I gather you're involved with different groups just from what's happened -- has anyone approached the advertising companies and the billboard companies and asked them to consider not dealing with cigarette advertising? THE ACCUSED: I personally am not aware of such efforts, but I can't help but think that -- again, there's no need for them to be rocket scientists to figure out that when there's as much damage being done to them, and as I understand there has been, I would think they would sort of clue in and think maybe people don't want this. But again I -- with respect, I appreciate your suggestion, and as soon as I leave here I'll actually phone them and inquire. THE COURT: Well, okay. It might -- can't tell you how to approach these people, but you know, letters and fancy signatures sometimes are helpful too. In any event, I'll hear you on an absolute discharge, if you have any comments thereon. MS. CARTER: It's entirely appropriate, Your Honour, in Crown's position. THE COURT: All right, sir. If you'd stand, please. All right. I found you guilty of committing mischief by damaging a billboard and you did that, but in view of the evidence that I've heard on sentencing I'm satisfied that it's in your interest and it's not contrary to the public interest to grant you an absolute discharge, and that's what I'm doing. The result of that is you will not have a criminal record arising from this offence. THE COURT: All right, sir. Thank you. (PROCEEDINGS CONCLUDED) Godfrey, J.E., P.C.J.